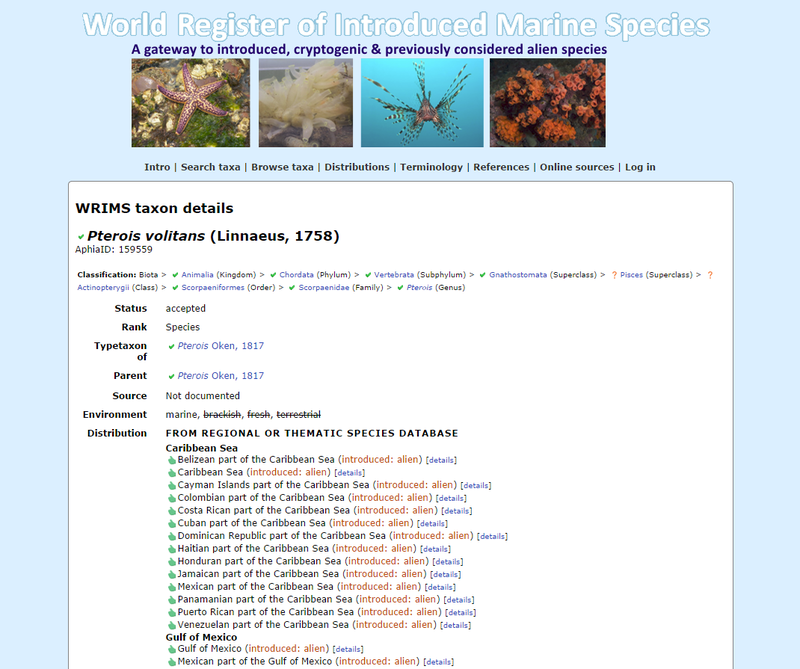 WRIMS records which marine species in the World Register of Marine Species (WoRMS) have been introduced deliberately or accidentally by human activities to geographic areas outside their native range. It excludes species that colonized new locations naturally (so called 'range extensions'), even if in response to climate change. WRIMS notes the origin (source location) of the species at a particular location by country, sea area and/or latitude longitude as available. If the species is reported to have caused ecological or economic impacts it is considered invasive in that location. Each record is linked to a source publication or specialist database. A glossary of terminology is available. Species of particular concern because of being invasive have a peer-reviewed profile on the Global Invasive Species Database (GISD). In using WRIMS, users need to consider possible species misidentifications in the sources, and that for some species it is uncertain which are their native and introduced ranges. Whether a species is 'invasive' can vary between locations and over time at a particular location. The WRIMS data resulted from a data collection project within the framework of EMODnet Biology, and was established by the Flanders Marine Institute (VLIZ) in cooperation with the IUCN Invasive Species Specialist Group (ISSG). The WRIMS website is developed and hosted by VLIZ. WRIMS is part of the consolidated database Aphia, the database behind the World Register of Marine Species (WoRMS).